The Dutch fascination with flowers, particularly exotic flowers, is legendary. So is the work of Jan van Huysum, who’s known as the “phoenix of all flower painters” by his contemporaries. This is perhaps one of his best works. “Terracotta floral bouquet” tapestry features flowers from all the seasons: roses, hyacinths, tulips – all painted directly from real flowers. His dedication to detail once led him to delay a painting for an entire year until he could obtain a real yellow rose to finish the picture. “Terracotta floral bouquet” was painted in 1740 for the duke of Mecklenburg. Notice the beautiful pyramid shape of the arrangement. Van Huysum was not only a painter, but also a superb drafter whose drawings were as famous as his finished works. 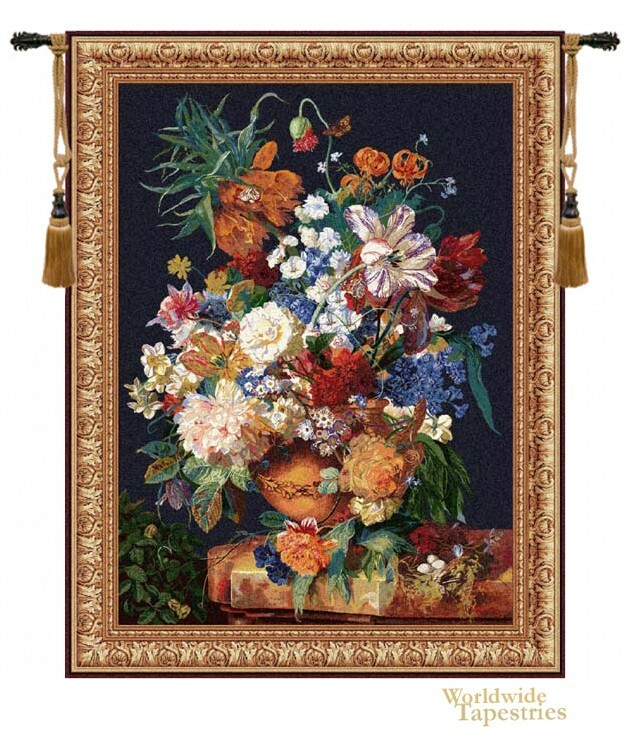 This magnificent floral tapestry is lined and has a tunnel for easy hanging. Note: tapestry rod and tassels, where pictured, are purchased separately. Dimensions: W 50" x H 65"